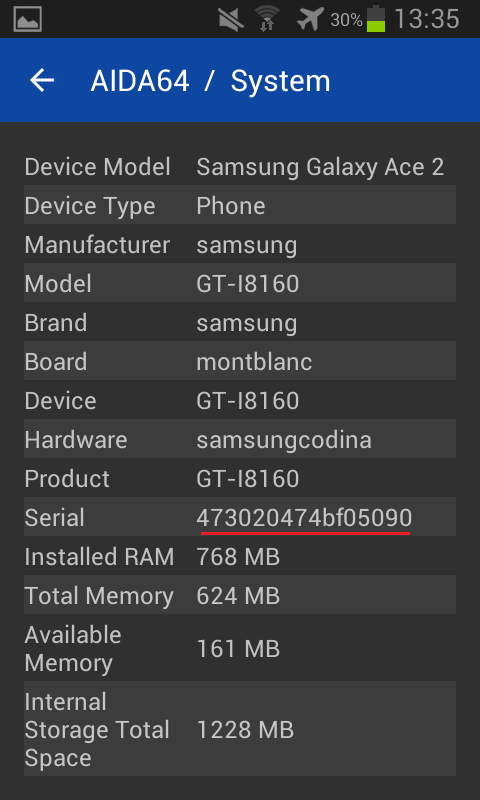 It shows the serial number that the device manufacturer (in your case: Samsung) has encoded in the Android profile of the device. Only Samsung knows what it may refer to It could be the actual device serial number, IMEI number, or even the MAC address of the WiFi or GSM adapter, etc. Yes. But manufacturer report me something like this: "We do not have any idea , what information is displayed by the other vendor's apps and where it had been taken". I think, this is serial for motherboard, not device itself. It refers to it as hardware serial number, but as I've mentioned above, it's simply a value that the manufacturer of the device encoded there. It could refer to basically anything that the manufacturer chooses, or could even be a bogus value that is the same in every device. Please, rewrite code for Samsung Galaxy Ace Smartphone in your next updates. Thank you so much. By the way, in ASUS MEMO HD7 tablet is everything OK. Serial is OK.
PS. As I understood this method is for devices with Radio Interface Layer ("ril.*"). So that it's for you to think how check if the device supports telephony. And if so, display this method, but else dislpay another ("ro. *" or "sys. *") I tried make that in my project, and I had success. We will add RIL serial number information to the next AIDA64 for Android app update.